Last Wednesday October 05, 2011, we lost one of the biggest geniuses of our times, we lost an icon, Steven Paul Jobs was not only an icon, he was an idol, an eternal source of inspiration, and a master. So many people drew courage from Steve and related to his life story: adoptees, struggling entrepreneurs, college drop-outs, ousted business leaders figuring out how to make a difference in the world, and people fighting devastating illness. We have all been there in some way and can see a bit of ourselves in his personal and professional successes and struggles. I am sure Jobs was admired from most of us, from iPhone fan boys and girls to people who decided to go against his ideas. People who would wait anxiously to see his amazing keynotes, people who would have every single Apple product but would go wait in a huge line to buy the new product he announced because after seeing his speech we felt that we couldn’t survive without the latest release. Today all of us at Kinex Media a website design Toronto company decided to write a blog to honor this great man who dared to think differently and got all of us thinking differently too. 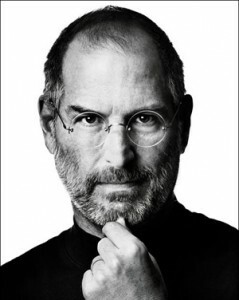 In moments like this there is not much we can say, only thanks, thanks Steve for being so amazing. RIP.